If you’ll look at classic works on military tactics from Sun Tzu to Carl von Clausewitz to Boris Shaposhnikov to Norman Schwarzkopf, you will find that studies of military tactic it’s nothing about a “gentleman’s agreement”. Quit an opposite: you advised to exercise your maximum strength against adversary’s most vulnerable weaknesses. The more disparity you can create between your strength and his weaknesses, the more successful and more admirable your tactical skills will appear. While your tactics should not conflict with your strategy (see: ' Sport, combat, and self-defense ' and ' Rules, Laws, and Tactics '), you should pursue this rule with outmost persistence. 1. Comparative advantage and how to use it. One of the greatest Brazilian soccer players, Garrincha , had perceived physical defect: his legs where slightly of different length. Ukrainian Olympic champion of 1952 Helsinki Summer Games in Greek-Roman wrestling, Yakov Punkin , suffer from (how we’ll call it now) post-traumatic stress disorder after four years as Red Army front line GI and Soviet Jewish POW in Nazi concentration camp in WWII. Both of them turn their perceived disabilities into almost supernatural abilities: no one can drift better then Garrincha, no one can do suplex better then Punkin. This it is: Garrincha and Punkin ware able to turn their individual conditions, that many people have and not happy about it at all and all other people happy that they don’t have it, into unique comparative advantage – Garrincha in soccer, Punkin in Greek-Roman wrestling. So, what is your comparative advantage? What you’re doing better or different from other people? We’re talking about judo in general sense. So, are you faster then anybody? Do you have exceptional balance or acrobatic skills? Are you strong weight lifter? What do you do the best? What do you do different? Do self-examination, make yourself a list and go to training [technical] page. 2. Technical advantage: how to create it and to maintain it. Let imagine a battle between two evenly numbered armies. It is late 18th century, the sunset of Frederick II the Grate of Prussia epoch, and outside of the window is a pastoral landscape of Northern Germany. Two lines of musketeers are facing each-other. But they are not exactly in parallel and attacking line comes at angle to the defending line, just like top cutting knife in that most recent French invention named after Dr. Guillotine Defending line can’t shoot all at once and when it comes to the bayonets then attackers have about two to one numerical advantage in every momentary fight. The defending line is smashed and running from the battlefield. What happened here? It was two even forces. Yes, they ware even on strategic level, but on tactical level, locally, at any given point of encounter during the battle, in a space of dozen square yards it was numerical advantage of the attacking force because of its winning tactic: angled flange attack. OK, it is linear mass infantry tactic of long bygone days. How it’s applicable to individual hand-to-hand combat, self-defense, or judo tactic? Rule #1: Laws of tactic are not changing, what is changing is their implementation. Human body has many muscles. Some are big and strong. Some are small and quick. Leg muscles are strongest. Hand muscles are much less so. Let note it. Also, muscles are performing not evenly in different work modes. When working in static resistance mode, muscles are significantly stronger then in active overcoming mode. Let note it too. The first technique, that shown to a new student in any wrestling / martial arts / self-defense class is breaking free from frontal asymmetrical top wrist grab. In plain English: it’s when you stand with your arms plain down on your sides and the attacker grabs your left wrist with his right hand. Let see how we can apply our notes to this technique. It can be a variety of higher level tactical and strategic goals in using this defensive action. I want to concentrate on only one of it: basic self-defense in line with principals of Commando Krav Maga – get free and out of range of hostile activity. For this pure training scenario we’ll assume obstacles-free open-space environment. 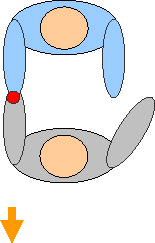 The base tactical principal of this technique is using strength of the arm against the weakest point of the grab: touch-point of thumb with index finger. This works very well with fast turn-and-pull arm movement. Turn makes grab less tight and pull opening the grab as nail puller getting a nail out of a wooden floor. Especially when training partner of about the same physical size (which is a standard practice in any entry level sport or self defense class – otherwise it will be unfair for stronger and bigger partner: he is not likely to be confronted or assaulted by a smaller in real-life sport or self defense scenario). But try to use the same exact technique against much larger opponent. It’s not likely to work. I tried it – I know. I’m about 5’3” and, on top of my long gone sporting career, was about 125 pounds. When your small wrist enclosed into a grab of extra-large sized hand you don’t have that vulnerable touch-point of thumb with index finger because thumb is locked overlapping with index finger. The turn movement is not easing grab because it’s not tight to begin with (if we dealing with minimally qualified opponent, who is worth to be considered). The grab feels more like steel handcuffs’ bracelet that tightening only when you trying to escape it. In such case the standard technique that I just described (and that described in all instruction books on sport wrestling, Judo, etc) just won’t work. I don’t want to address all gradual enhancements to this base technique such as grabbing of your second hand or leg, directional changes or contra combinations. This may work (depends on the tactical situation and your skills), but it is diverting from you’re your original goal: to get free and out of the harms way ASAP. The radical change on surface doesn’t looks like a change at all: just instead of trying to pull your hand while standing face-to-face with your opponent, you pulling your grabbed hand close to your chest and, with wide circular backward step around your grabbed hand, turning back to the side of your opponent just outside of his grabbing arm while targeting to touch his grabbing arm elbow with elbow of your grabbed arm. Unless your opponent is indeed steel-made Terminator, it will work. You will break free standing in his blind spot and facing the escape road. The difference is that instead of using your arm muscles against his hand muscle (witch normally giving good enough strength vs. weakness ratio) you will use power of your legs, weight and dynamic energy of your body, resistance mode of your arm muscles (your arm is not moving – just your body) plus level created by your arm. I had problem to train this technique with even opponents: I didn’t feel any resistance. Please remember that described technique, while it’s practical and well tested, is not a “silver bullet” solution for any situation. The choice of your particular technique should be based on more factors then just tactical power leverage. But in any scenario and with any technique, using of this power-leverage micro-tactical pattern you will enable to improve your skills and to create technical advantage vs. your opponent.